I pre-ordered this as soon as I knew it was being published, all on the strength of The Martian, which I loved. So now I can tell you that Sophomore Slump is a real thing. Artemis isn’t a bad book, it’s just not a great book. I’m not sure it’s always a good book, but I’m up and down about that. As I was beginning it, The Housemate read me a highly critical review by the AV Club. Most of the review was about how the main character didn’t feel like a woman. I felt that was relatively unimportant, that gender wasn’t an issue in the story as far as I’d read, and honestly I still feel that way. Weir could have made his protagonist male and changed almost nothing about the narrative. Had this book been about women’s issues, I might have felt short-changed, but as it is, this is a pretty standard thriller, and representation is way down on the list of things one expects from this genre. However, irony is ironic. When I picked the book up again after hearing the review, I found that it had been close to being right. Not spot-on, just close. None of the characters had any depth for me, mostly they were interchangeable plot devices. Again, that’s standard fare in the genre, so I’m willing to shrug and let it go in spite of the fact that I know Weir can create dimensional characters. But what flummoxed me was that the action sequences were so dull. They were highly technical, and where that worked in The Martian, it does not work here. I found myself racing through those parts to get to the human interactions, which if they didn’t have the depth I could have hoped for, were at least more interesting than all the tech stuff. I found myself thinking that someone told Weir that “people loved all that technical stuff in The Martian, so maybe you should do it again, and do more of it.” Yeah that worked when it was a single man against the elements and ultimately against technology. But here? It’s kind of flat. At least that’s how it felt to me. So in the end, while I enjoyed parts of it, those parts proved greater than the whole, and I can’t be super enthusiastic the way I was about The Martian. That makes me sad. 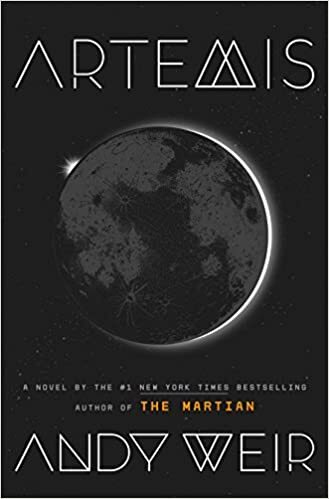 It doesn’t mean I won’t read the next thing Andy Weir publishes, but I’m not going to be so quick to pre-order it next time. Ok – let me start right here. This is no “The Martian: The Sequel”. It is a completely different story done very differently. I’m guessing there will be A LOT of people who think that’s what they’re getting and get very disappointed when they get this instead. Which is sad, because this really is a very good book. Jazz lives on the moon, in a city called Artemis. Named after the moon, of course. Travel between the moon and earth is consistent, and the moon has become a vacation hot spot for people of all types, though the only ones that afford to live there year-round (other than those who work there) are filthy rich. She is a smuggler, and works offloading cargo ships as well. When one of her smuggling regulars asks her for a shady job, her first inclination is to say no. Then he names his price, and she runs with it – she has a specific goal she’s saving for, and this will clear it and then some. But that’s when things get crazy, and the book takes off like a rocket (put totally intended). This book does have a few puzzle pieces missing. There are some choices that Jazz makes that will obviously be very bad ones. There are a few things that will happen that readers will see coming. Having said that – the book is a fun ride from beginning to end, even *with* those puzzle pieces missing. Jazz as a character was interesting, particularly as it would be difficult to create a character more opposite from the one in Weir’s first book. The science sprinkled throughout was a little harder for me to understand than in the first book, but for those who appreciated it then – you will appreciate it here as well. Overall, if readers go into this book just looking for a good read, then this might fit the bill. Again – it’s not The Martian, but it has strengths and weaknesses all its own. I found this to be an overall good read, not great. Def not as good as his first. You will enjoy it and I’m sure it will be made into a film very soon. I just found it to be a little too unbelievable.